If you wish to contact us, please send us an email or use the contact form below. If you do not receive a response within 72 hours, this would indicate a mail delivery issue, then please phone us on either number listed below – we will phone you back. We offer free delivery within a 20 km radius of our base in LE COUX et BIGAROQUE. 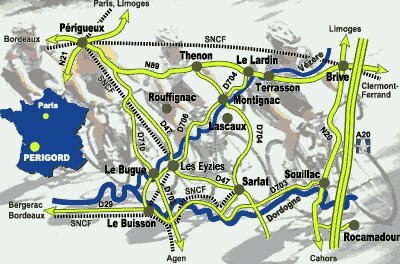 Villages within this area include: LES EYZIES, LE BUGUE, LIMEUIL, TREMOLAT, LALINDE, LE BUISSON, CADOUIN, BELVES, SIORAC, ST.CYPRIEN, LA ROQUE GAGEAC. MEYRALS. 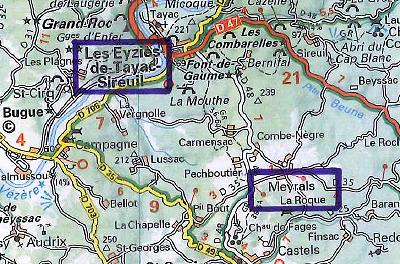 To reach LES EYZIES by train: From Paris Austerlitz station, via Limoges. From Paris Montparnasse station or Charles de Gaulle airport, (TGV) via Bordeaux/Libourne. From Bordeaux St Jean station. To reach LALINDE, LE BUISSON, SIORAC by train: From Bordeaux St Jean station. Nearby airports are BERGERAC and BRIVE.